Beach and coastal house plans are built on piers or stilts shielding the home from flooding, tropical storms or hurricanes, while borrowing design elements from Spanish, Mediterranean and even Victorian style home plans. 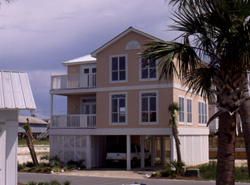 Beach houses and coastal home designs are built on narrow lots due to the high price of coastal real estate so often they have several floors. However, many beach homes feature panoramic windows and plenty of outdoor living space for enjoying waterfront views, plus they include a casual and open interior. Exterior materials may vary, but coastal home construction should be able to withstand salty, damp air. Shop our Beach home plans and Coastal home designs featuring raised main floors and plenty of windows for waterfront views making these dwellings perfectly designed for coastal locations. With such a wide selection, you are sure to find coastal plans you will love and you will want to retreat to whenever possible.